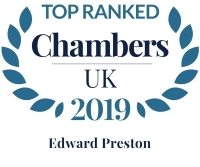 Edward is a Senior Consultant Edward Fail, Bradshaw & Waterson solicitors and is recognised as one of the very best criminal solicitors in the UK. He qualified in 1981, having been articled at this firm to the renowned solicitor Adrian Neale. Eddie was the Senior Partner at Edward Fail Bradshaw & Waterson until 2018. Eddie has represented hundreds of clients charged with all types of serious criminal offences. He has particular expertise in cases of murder, fraud, robbery, sexual assault, white collar crime, money laundering, and asset forfeiture/recovery. He has worked on numerous cases involving victims of police corruption and has been instructed in many important Appeal cases. He has represented clients in investigations and proceedings instituted by prosecuting authorities including the CPS, DPP, DTI, IR, SFO, HSE, HMRC and GMC, and has dealt with cases before the Magistrates’ Court, Crown Court, Court of Appeal, Administrative Court, House of Lords, Coroners Court, ECHR, Criminal Cases Review Commission, GMC., P.A.T and MHT. Eddie's basic philosophy is client care and privacy; giving the personal touch to any case in which he is instructed. 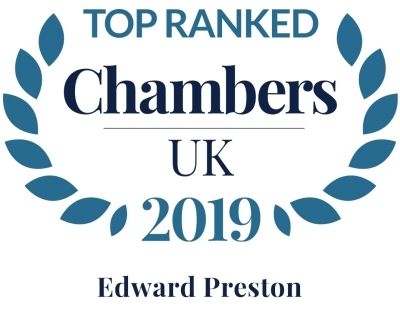 Eddie has been described by Chambers & Partners over the years as being "one of the finest criminal lawyers of his generation and the possessor of wonderful tactical awarenesss", "...not afraid to stand shoulder to shoulder with the clients", and valued for his "no-nonsense pragmatism". Edward Preston has "fantastically sound judgement" and "gets the shape of the case right very early on," according to commentators. His criminal practice covers serious charges ranging from burglary to drug supply and murder." "Edward Preston is praised as "exceptional" and "very inventive" and is recognised for his capabilities in armed robbery and sexual assault cases. Sources say: "He is tactically very astute and spots problems a mile off. He thinks things through properly and clients always like and trust him."